Good news just keep coming! We're excited to announce today that we've been accepted into the Magic Leap Independent Creator Program! You can read more about the official announcement here: https://www.magicleap.com/stories/blog/meet-the-creators. We'll be bringing Gadgeteer (Steam page here) to augmented reality through the Magic Leap One device. 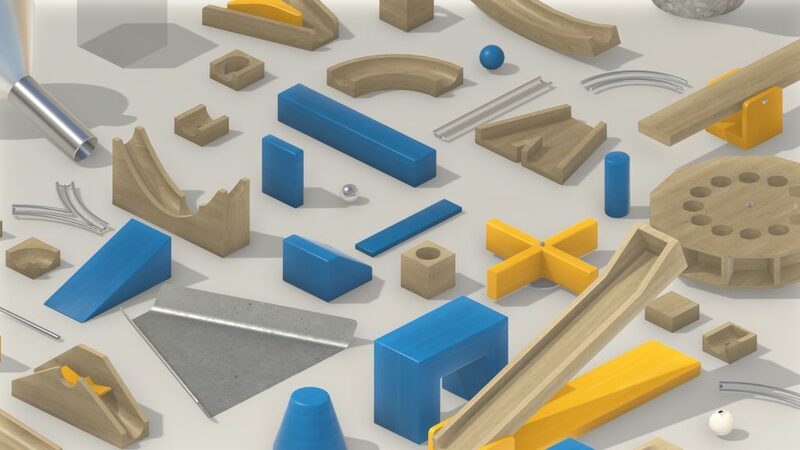 Ever since the beginning, we thought Gadgeteer would make a fantastic AR game seeing how players would be able to use their home environment—filled with interesting geometry—to build on top of. Tired of building in your room? Then move onto the living room or kitchen! We're going to have a lot more news for you in the coming weeks and months. So stay tuned for more details. 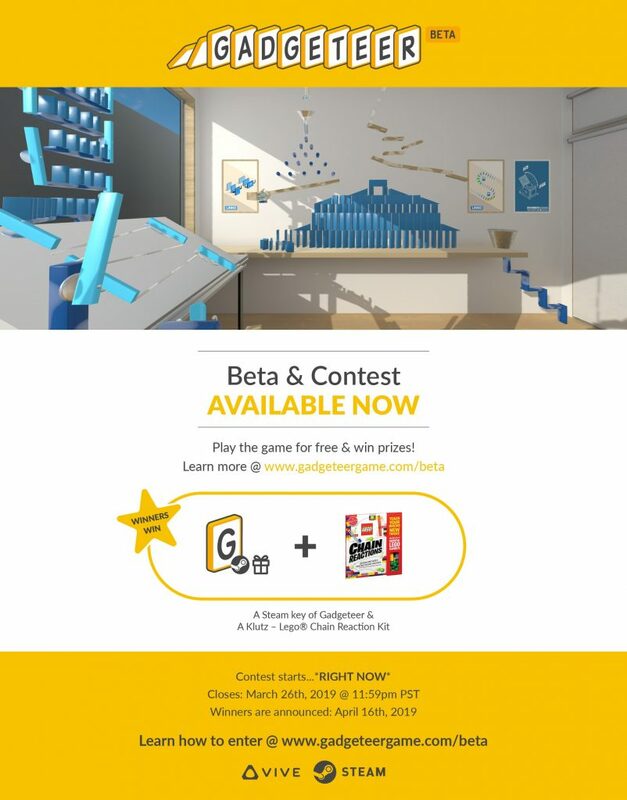 If you're lucky enough to own a Vive headset, you can play Gadgeteer for free & win prizes but for a limited time only. We've received some epic machines from the community so far, and we want to see more! We're extending the beta contest until April 14th @ 11:59pm. Download the game on Steam and submit your entries before time runs out. I’m excited to announce we’re finally ready to release Gadgeteer as a free beta demo. To celebrate the occasion, we’re giving away prizes to the top 3 chain reaction builders. All you have to do is play Gadgeteer Beta Demo for FREE and share your machines. Welcome to the second article in our blog series, Meet the Gadgets. This one is called Meet the Spinner. The goal of this series is to help you create more elaborate and crazier machines by introducing you to the gadgets available to you in Gadgeteer. In this Meet the Spinner post, we’ll be covering the SPINNER gadget. Much like the domino gadget we recently wrote about, the spinner is an important, versatile gadget you’ll likely be using in your chain reaction machines. Let’s talk about each of these in more detail. 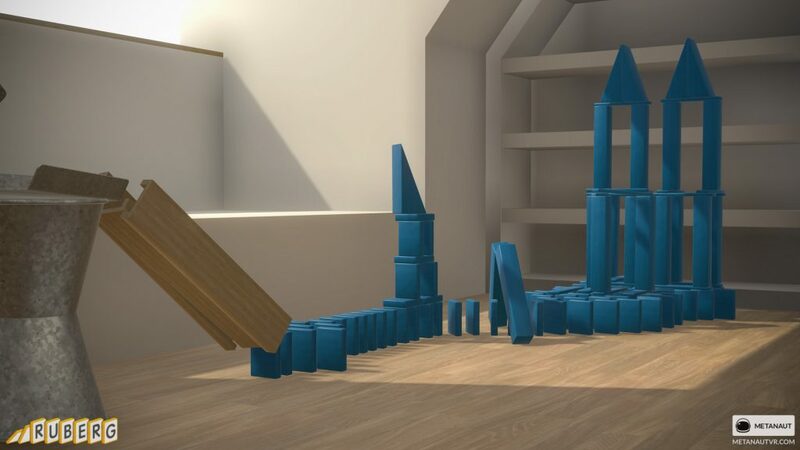 No one can dispute how relaxing and mesmerizing falling dominoes are, but interesting chain reaction machines have more than just objects falling over each other. They twist and spin and can even throw objects around (we’ll cover the gadget that throws in future Meet the Gadget articles). Using different ways to transfer kinetic energy is what differentiates a great machine from a mediocre machine. Use spinners to provide that extra flair in your machines to make them even more interesting. Besides helping cosmetically, spinners can help you span long distances horizontally or vertically when placed side by side. You can reach dizzying heights by creating a long chain of them against a surface. Even spanning short distances vertically could be challenging sometimes. Spinners can help with that. Just place a single spinner gadget to get to the upper shelf. Spinners are also remarkable for being able to span distances quickly. The closer you place a spinner’s bar against another spinner’s bar, the faster the reaction. You can even achieve instantaneous reaction across distances by placing bars right against each other. How neat is that? Left: Instant chain reaction with spinner bars touching each other; Middle: A gap in between the bars create a slower chain reaction; Right: Even slower still with more space in between. One of their most important functions is to help you gain vertical distance (i.e. height). With increased height, you can add more kinetic energy back into your machine by using gravity. You can achieve this by displacing a gadget with high potential energy, such as a gadget placed high on a shelf (no, we’re not violating the first law of thermodynamics here). Although the initial kinetic energy from the ball is low, we can add more kinetic energy into the system by displacing the ball above. Spinner are easily activated. All you need to do is give them a little push and they’ll spin round and round. This gives them the ability to easily start a chain reaction—for example, pushing a ball onto a track. This spinner activates the ball & track segment of this machine. A lot of people have been asking us about our Story / Puzzle mode. Here’s a sneak peak of a level that asks you to play around with spinners! Here’s a level from our Story / Puzzle mode using spinners as starters. Speaking to their versatility, spinners can also end a chain reaction as well—just give the spinner a nudge to put it into position. It’s easy to turn a spinner into a starter or gate. The spinner gadget is one of our favorites for its ease of use and versatility. It complements well with dominoes and it adds extra flair to your machines while providing more interesting mechanics. In our next Meet the Gadgets post, we’ll be talking about the ball & track gadgets. When I was young, I spent a lot of time standing by the magazines section of our local grocery store reading gaming magazines like PCGamer. Its flashy cover and exciting news about upcoming games made these family trips to the store so much more bearable. Imagine the look on my face when—last month—our VR puzzle game, Gadgeteer, was listed as one of the most anticipated VR games of 2019 by my childhood favorite magazine, PCGamer! We're so honored to be part of this list, especially among impressive titles that we ourselves look forward to playing. Being perhaps the smallest studio to have made it in the list, we're going to work extra hard to meet our release date of April 2019. Thank you PCGamer for supporting small VR studios like us! Welcome to the first article in our blog series, Meet the Gadgets. 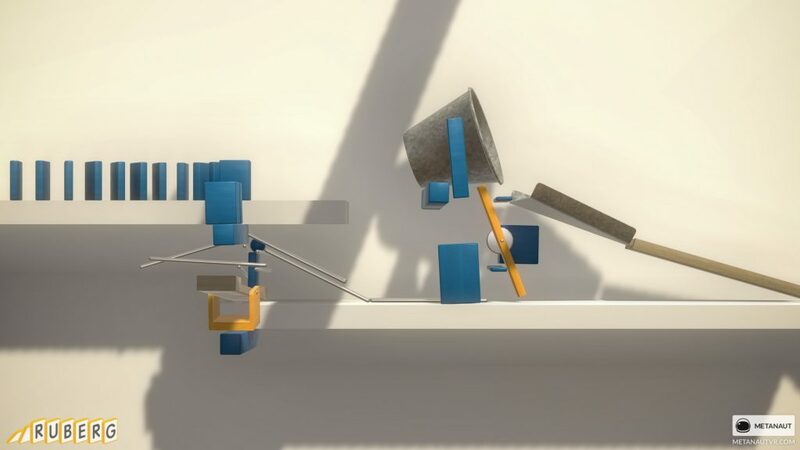 In this series, we cover tips, tricks, and techniques to help you build an elaborate chain reaction machine in our VR game, Gadgeteer. In Gadgeteer, you use what’s called gadgets to build your machines. These gadgets connect to each other to carry a chain reaction from one place to another. The first and most popular gadget we’re going to cover is the domino gadget. Dominoes have a wide range of uses. They’re good for quickly traversing long distances, getting over small discrepancies in height, and adding aesthetic flair to your machines. And since Gadgeteer is a game based on physics simulation, what you can do in real life with a set of dominoes, you can do in our game! If a domino line is the walking & running of the game, then the split is the jumping. The split allows you to branch out your chain reaction of falling dominoes so that you can create synchronous and asynchronous reactions in your machine. Most of us place dominoes on their ends, but you can place them on their sides as well! Doing so creates a faster domino chain. This domino technique is called the sonimod, which is ‘dominos’ spelled backwards. The domino wall is a simple structure that is so satisfying to see topple over. It comes in many variants but the one we’re going to cover is the column technique. Building a domino wall can be trickier than the previous techniques we’ve covered; it requires more precision and patience but the payoff is worth it! The skinnier cousin to the domino wall is the speed tower. It’s an easier structure to build than the domino wall, and what it sacrifices in stability it makes up for in speed. Now we’re getting to the fancier domino tricks! This technique is called the crossover. It allows for a chain reaction to cross through itself. Another fancy domino trick is the fallback. 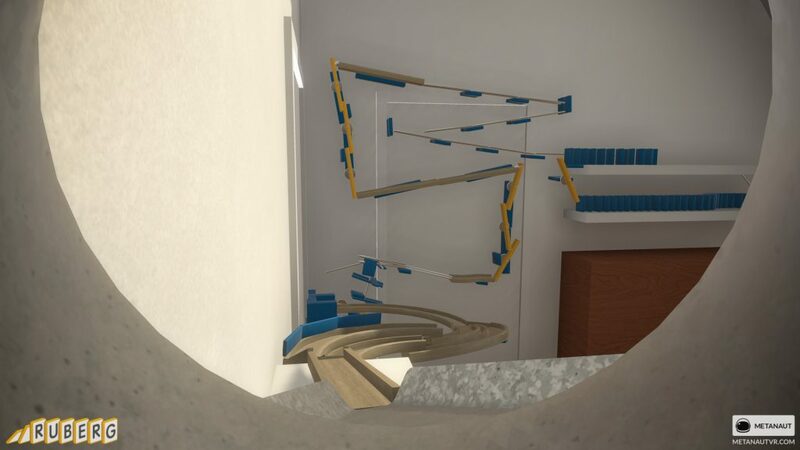 It allows for a chain reaction to loop around vertically—falling back onto itself in the process. Last but not least, here’s a domino spiral for added mesmerizing effect! Hopefully, you’re now more familiar with the domino gadget! People often mistake Gadgeteer as a “domino building game” but it is so much more than that. In our next blog post in the Meet the Gadgets series, we’ll be introducing a gadget that pairs well with the domino: the spinner gadget. One of the key mechanics in our upcoming VR puzzle game—Ruberg—is building a wacky chain reaction machine with a variety of gadgets (gadgets being key objects that users can use to build a machine). It is thus important for the spawning of these gadgets to be easy and useful. And in a world with no limits, making the final decision on that user experience can be difficult. 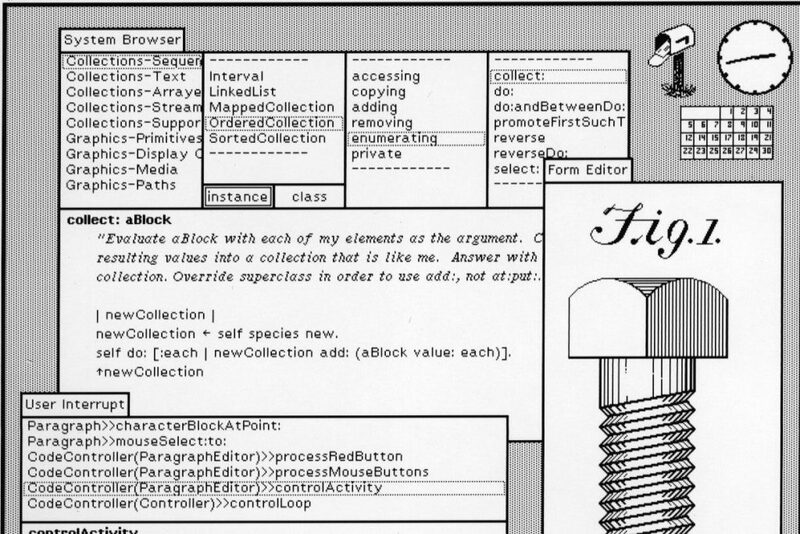 To help us narrow down an approach, we looked at the history of graphical user interfaces (GUI’s) for inspiration. Human-computer interfaces have more or less shared the same key interface metaphors over the past few decades. One such metaphor is called the desktop metaphor in which the computer screen is treated as the surface of a desk (hence the name, desktop). In this metaphor, documents and folders resting on the table’s surface become embedded inside of windows on a computer screen. These windows can be moved around on a two-dimensional plane much like pushing objects on a table’s surface. The desktop metaphor underlies today’s window managers. 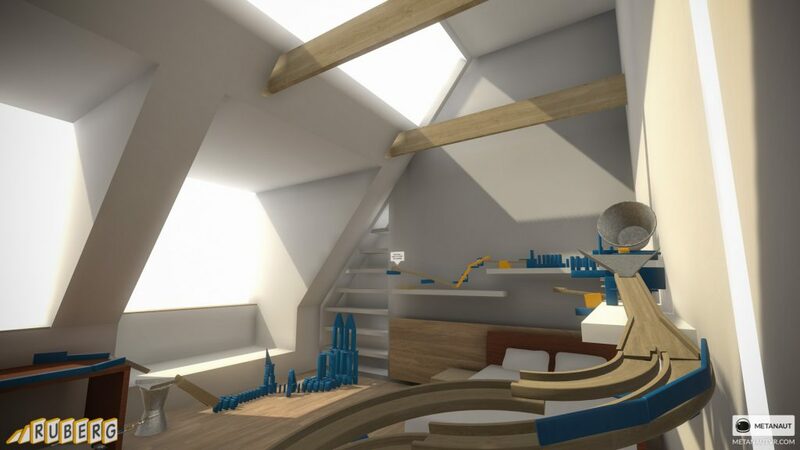 If desktops are inspired by real-world tables, what would this desktop look like in VR? We came to this question when we realized that the desktop metaphor was created to fit a three-dimensional view (of the table) into a two-dimensional view (for the computer screen). Why then, should we use an abstracted model when we can go directly to the original source of the metaphor? We are, after all, dealing with three dimensions instead of two. This is the simple idea we came up with. After a few rounds of testing, we realized that there are two modes of using this “table”. 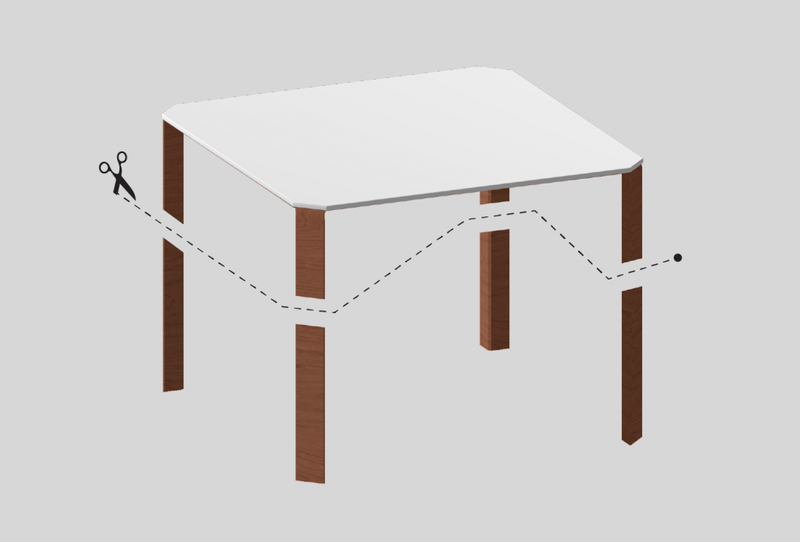 One mode where the user can take the table with them, which we’ve called a shortcut access, and another mode where the user can leave behind the table floating in space, which we’ve called area-dependent access. At this point, we thought the name table had to go. As you can see above, our table isn’t so much a table as it is a panel—and so we decided to call it a panel. Brilliant decision making—I know. The value behind the shortcut access is obvious: by allowing users to bring their “panel” with them, they can have quick access to any gadgets on the panel. We then thought about how groups of panel will follow the user. Will they float in front of the user? Or will they be attached to one of the controllers? We went with the latter purely because the distance is minimal between the gadget needing to be grabbed and the hand that’s doing the grabbing, and physically attaching something to something is more grounded in reality, which is exactly what the game is about (the building of chain reaction machines anyway *spoiler alert* but not the story). As a bonus, there’s a lot more control over how a gadget can be grabbed out of the panel if both hands are involved in the process. The shortcut access is useful but what’s also useful is being able to leave some panels in the air as an alternative way of accessing gadgets. This has some benefits: some users may prefer a single-handed operation, and others may want to massively spam a pile of gadgets to pick from versus grabbing from the panel and then placing one gadget at a time of which the area-dependent access affords. It was great fun thinking about how a desktop might look like in VR and how users can use it to be productive. What was surprising to us is how relevant old metaphors were. We may not need the abstraction from having to convert 3D paradigms into 2D paradigms, but it was helpful to look at the source of the metaphors to see what early designers wanted to emulate. Modern interfaces have also evolved quite a bit and so we were able to draw inspirations from them despite them still being abstractions. That’s it for this month. We’ll be releasing another dev blog about another feature in Ruberg next month. In the meantime, if you think you’ll enjoy building wacky chain reaction machines or solving challenging physics-based puzzles, please add Ruberg to your Steam Wishlist! We're excited to launch the pre-alpha version of Ruberg today! The goal of the pre-alpha is to have people play with the core mechanic of creating and using gadgets to build something incredible. So, kindly let us know what you think of the demo here. Here's another weekly peek into our upcoming chain reaction machine game, Ruberg. This time we wanted to show how we've ended up with sliders instead of buttons for our in-game options. In our game, players interact with the environment through the use of grabbers. Because building a chain reaction machine often requires a lot of finesse (e.x. placing a domino in the middle of a bunch of placed dominoes), we decided to make the controllers not collide with the environment. This creates an issue, however, when interacting with buttons, which requires you to press down on. Squeezing the trigger button on the controller when the controller intersects the button. But, Andrew and I didn't like how there was a disconnect between the affordance of the button and the action required to activate it. Our experience in the opening scene of The Lab confirmed this. Using the grabber to grab onto the button and to press down on it. This felt like too much work for the user. Having the controller collide only with the button but still not with the environment. This creates two different characteristics for the same controller. Built-in safeguard to prevent accidental activations. Sliders offer this by way of having the user drag the slider across a distance. Built-in ability to allow changing of minds. You can backtrack on your decision while in the process of activating since the slider must travel to the end of the track to activate. A physical and fun way to activate/deactivate options in a fun physics-based game. Subscribe to our Youtube channel if you'd like to see more sneak peeks of Ruberg. A good chain reaction machine is multi-dimensional. The chain reaction moves on top of surfaces, but it also travels vertically. There's something special when gravity is used to assist the continuation of a ruberg. It's for this reason, we've added the ability to glue any gadget onto a static surface such as furnitures and walls in the level. The ability needed to be easy to use and allows for quick actions. We didn't want players to have to perform rote interactions for something they may be doing often and in succession. PS: We've updated our controller models! Also, an alpha demo will be coming shortly. 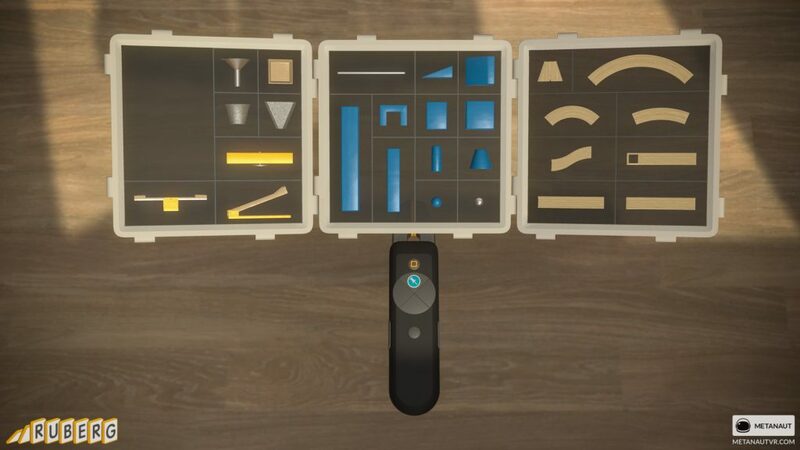 Most menu/tool systems in virtual reality are flat and fixed in place. We believe they are anachronisms in the VR world. They adopt design decisions that were shaped by limitations in screen estate and 2D interactions that do not exist in VR. Custom-arrange panels to form any shape the user prefers i.e. cube menu, fan menu, etc. Here's a first look at our chain reaction virtual reality sandbox game, Ruberg. We are wrapping up at #GDC2019! The video game industry adds $3.2 billion to Canada’s GDP annually and supports more than 20,000 jobs (via @ESACanada).